The final day of the 2010 NRHS Convention started with me driving from the Clarion Inn to the parking structure across the street from the Hilton. I got my parking ticket validated and then waited to board the bus to the loading area in Duryea. It was a fairly quick bus ride and soon I was on board in the first coach behind the open air car. The train had a consist of Reading Northern 4-6-2 425, Tender 425 AT, Lehigh Scenic Railroad SD-50 426, Open Air Car 3 Summer Wind, Coaches 305, 302, 304, 301, 303, 309 and 306, #5 Schuylkill River. and #1 Black Diamond. I got off for some pictures. After the last bus arrived we were ready for our 8:00 AM departure. 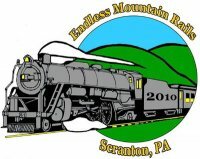 The Reading Blue Mountain & Northern Railroad, with corporate headquarters in Port Clinton, Pennsylvania, is a privately held railroad company serving eight counties in Eastern Pennsylvania. The Reading Blue Mountain & Northern Railroad began serving customers in 1983 as the Blue Mountain & Reading Railroad on the company's original thirteen-mile shortline connecting Temple to Hamburg, PA that Conrail had abandoned the line and, as a result, the line came under the control of the Commonwealth of Pennsylvania. In 1990, opportunity knocked and the railroad purchased one hundred thirty miles of railroad from Conrail, known as the "Reading Cluster." The trackage was comprised of former Reading Company track to the heart of the anthracite coalfields in Schuylkill County. As Conrail continued their program of spinning off rail lines that did not fit into its core network, the Reading Blue Mountain & Northern expanded again. In August of 1996, RBMN acquired a portion of Conrail's Lehigh Division. Comprised of over one hundred miles of former Lehigh Valley Railroad trackage, the rail line stretches from the southern foot of the Pocono Mountains at Lehighton through Wilkes-Barre and Scranton and onward to Wyoming County. RBMN negotiated overhead trackage rights over the Carbon-County owned 18-mile railroad that runs between Hometown and Jim Thorpe in order to connect its two divisions. In August of 2001, they completed negotiations with NS and Procter & Gamble that resulted in their taking over exclusive service to P&G's largest manufacturing facility at Mehoopany, PA. Working with NS they were able to provide P&G with an excellent service and rate package that ensured the inbound raw material continued to move by rail. As a result, RBMN has enjoyed over four thousand carloads of P&G business each year since signing the agreements. The two Divisions were now connected and the Lehigh Line had a solid business base from both on-line customers and overhead trackage rights revenues. Moreover, the Lehigh Division was a smooth operation as a result of an agreement made in May of 2003 to have NS deliver inbound interchange cars to RBMN at Penobscot. By the time RBMN celebrated its twentieth anniversary in the fall of 2003, it was a very successful shortline. They had taken their Lehigh Division and connected it with the Reading Division. They had built solid traffic bases on both sides of our system, and they had put in place an excellent operation with upgraded locomotives and freight cars. They were gaining a reputation for customer service and attention to detail. Also in 2005, RBMN took a big step forward to expand its passenger excursion business. RBMN had always had a passenger program. But with the acquisition of the Lehigh Line and the new connections between Jim Thorpe and the Lehigh River Gorge, RBMN was now positioned to offer the region a quality tourist attraction. In May of 2005, the Lehigh Gorge Scenic Railway was born. Every weekend and holiday from May to Christmas, hundreds of visitors to Jim Thorpe board our passenger coaches for a ride into the Lehigh Gorge. With a solid freight business in hand and a growing passenger operation underway, Andy Muller decided to begin the renovation of his steam engine, No. 425. At the end of 2007, No. 425 was back in service. In 2008, No. 425 would take thousands of guests on steam excursion trips throughout their operating territory. Steam engine425 was originally built in January 1928 as the Gulf, Mobile & Northern 425. She later worked for the Gulf Mobile & Ohio 580 before moving to Louisiana as their 2 and later 4. It later became Valley Forge Scenic 425, and finally Blue Mountain and Reading Railroad 425, and she is now currently restored as Reading Blue Mountain 425. Our trip started at MP 1.3 and we backed to CP Pitt to reach the mainline. This small piece of track was new mileage for me. Our train backed by the yard office and crossed the Lackawanna River. Soon we were heading forward and off to Jim Thorpe. The train took the curve as we headed by the junction. Crossing over the track the trip started on. A Reading and Northern map in the open car. Crossing under the CP Rail mainline we rode on the first trip to Sudbury on Tuesday. The train passed through Avoca and Dupont before it started up the grade to Mountain Top. Three views as the engine climbs the grade. View looking back at Penobscot. View of the ridge line through some trees as we start down the grade. The train enters the White Haven Tunnel. Two views of the old Engine House in White Haven. The train crossed the Lehigh River and is heading to the Lehigh Gorge. Three views along the Lehigh River in the Lehigh Gorge. Three views in the Lehigh Gorge. Two more views of the Lehigh Gorge. Three more views of the Lehigh Gorge. At Independence the Norfolk Southern line enters the Lehigh Gorge. We stopped for a pair of Photo Runbys. Lehigh Gorge Scenic Railroad 426. Reading and Northern 4-6-2 425. The rock strata in the Lehigh Gorge. Curving through the Lehigh Gorge. Crossing the Norfolk Southern line. This abandoned CNJ PQ Tower as we neared Jim Thorpe. At Nesquehoning Jct we met the Lehigh Gorge Scenic Railroad train before we arrived into Jim Thorpe and had until 2:15 PM to look around the town.